I am naturally a pretty high energy person, even before kids. The aroma of coffee never did anything for me until my pregnancy with the twins. It was almost like I wanted so badly what I was now not able to drink so much of. I indulged maybe once a week, maximum one cup per sitting. 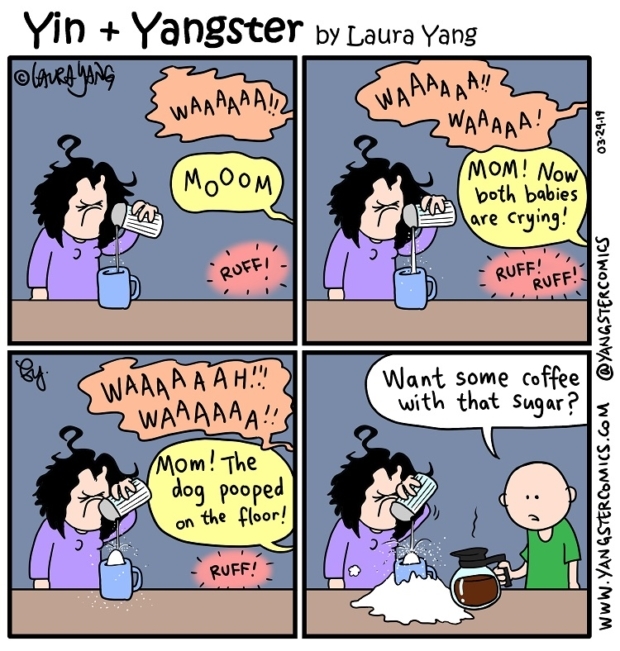 Post pregnancy, I now understand why older folks drink coffee — work, kids and life is exhausting! Plus people bond over a nice steaming cup, or frigidly cold ‘cup of joe’ if you prefer. Look at me, trying to talk all “coffee-like”. lol I’m pretty new to the scene so I don’t count myself a connoisseur by any means. In fact, the husband always teases me at how I take my coffee — with loads of cream and sugar! And so, this cartoon was born!